I used to be able to search for a login if 1password doesn't correctly detect the site I'm on. This happens every time in Firefox because I guess it scrambles the URL as a privacy measure. @ID3N: Which browser version are you using? Today I tried to login to feedly with Firefox Beta. 1Password could not match the detail. Thats not the problem, but there is no possibility to search for an alternative. Please add. See attached image. Thanks @Henry for looking into it. I however don't see how removing search is an anti-phishing measure. Users will still open the 1password app and manually enter in their login credentials into a phishing site regardless. All removing search does is make it more annoying for cases where a user has a password saved for blah.com that has region specific version for blah.co.uk for example. 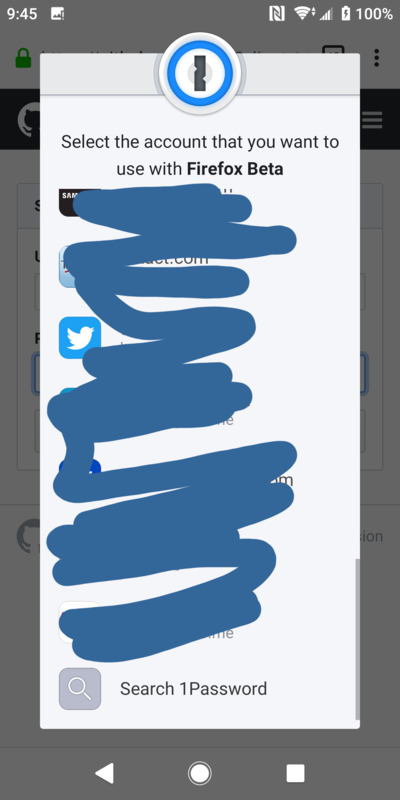 I know you can add multiple "websites" for the stored login but this is a pretty fiddly process as I don't see any way of doing this from the Android client. You're welcome @ID3N! As with all our apps and extensions (Mac, iOS, Windows, and Android alike), you can only fill Login items with matching URLs into websites, rather than just any Login item. As for how that helps to prevent phishing: say you've just clicked on a link in an email that just brought you to facebrok.com. 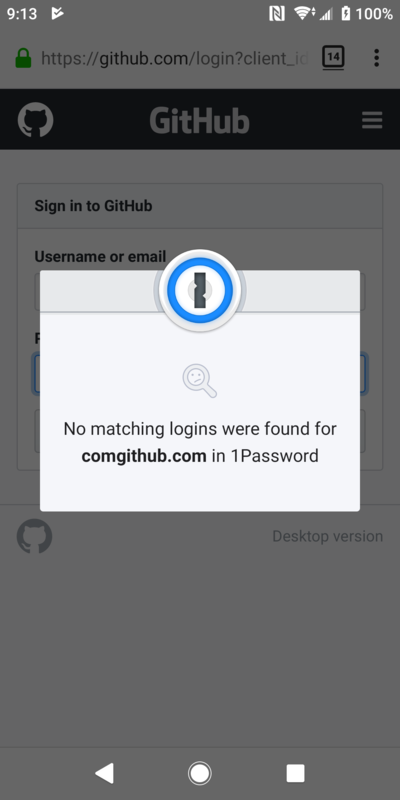 Instead of letting you search for & autofill your Facebook login, 1Password will say "no logins found for facebrok.com in 1Password." To overrule that, you'd have to ignore the obvious typo, head into the main app, and copy/paste your credentials into the website. Of course you can do that, but that simple security measure can help many people avoid getting their passwords phished by a malicious website. I have passed on the feedback about adding more website fields to Login items in our Android app—that's definitely something I'd like to see happen soon too! And do let me know if you have any more questions/feedback and I can help with. @Henry fair enough. If the multiple website fields were added to the Android app, I agree that would be a good compromise. Thanks for passing that on to the relevant team. Thank you for the extra detail @Philipp! We've narrowed it down to being an issue just with Firefox Beta, on URLs without a subdomain (e.g. mobile.twitter.com works fine, but feedly.com becomes comfeedly.com). The problem lies on the browser's side, but we'll see if there's anything we can do to help them resolve this, so filling will work properly.